RUNNING IN THE RAIN – A trio of runners make their way down Warm Bay Road in Atlin, B.C. for the annual Atlin minimarathon. More than 60 runners took part in the event, shattering the old record of 44 (top). WEATHER BREAK – Marathoners enjoy a momentary break in the rain on Saturday morning. Simon Lapointe was the top runner, completing the 24.5-km distance in 1:34:26. There aren't too many marathons in the world where you can look at the runner next to you and recognize them from performing on stage the night before. There aren't too many marathons in the world where you can look at the runner next to you and recognize them from performing on stage the night before. 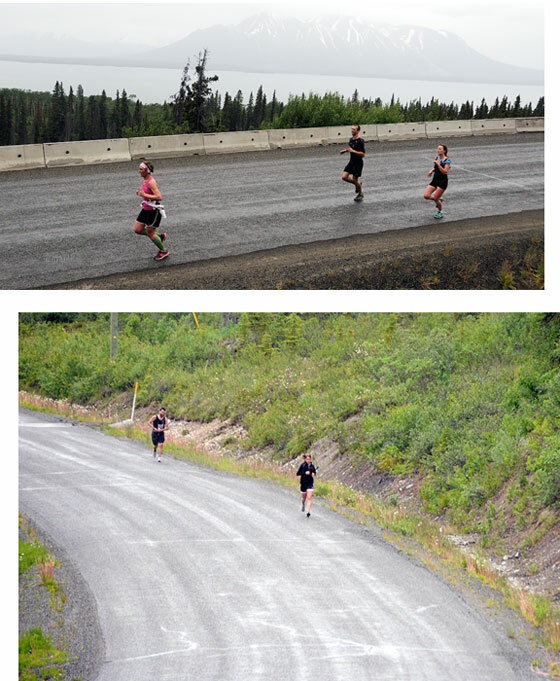 The annual Atlin mini-marathon is one of those events. The 32nd running of the marathon was held this past weekend and despite a heavy downpour a historic turnout went along with it. Sixty-three runners crossed the finish line, competing across three distances, 1.6-kilometres, 6-km, 11.5-km and 24.5-km. The event kicked off at 9 a.m. on Saturday morning, with the crowd of runners departing from the Atlin Arts and Music Festival Grounds (AAMF) at Tahrane Park and heading to the local warm springs. The unique event draws a mixed field of competitors, ranging from serious runners to festival goers searching for some exercise. "It's a nice break from the festival,” said Michele Markley, whose husband, Terry Markley, started the marathon in 1980. The marathon has been taking place every year since, with the exception of 2010, and running on the same weekend as the AAMF. "The crowd ranges from little kids, to performers, to festival goers,” said Markley. Markley attributed the influx of runners to advertising the event with the AAMF. The previous record number of marathoners was 44. "I think people saw it in the program and on the website as well,” said Markley. This year the marathon also attracted a range of performers from the AAMF, including Yukon singer and songwriter Gordie Tentrees. Tentrees placed fourth overall in the 11.5-km division with a time of 52 minutes and 42 seconds. Markley said the hey-day of the marathon was in the 80s when the event consistently drew a large Whitehorse crowd in addition to the Atlin running community. She said each year, there is a loyal crowd of athletes that return. Markley said the marathon began as a casual run and they try their best to keep it that way. This year, the field was paced by Simon Lapointe, who finished the 24.5-km distance in 1:34:26. "He was an amazing runner,” said Markley, adding that Lapointe's time was just three minutes shy of the course record. He was more than ten minutes ahead of the second place runner, Matthew Moss. Lapoine ran the nearly record setting pace through horrendous conditions. With rain pouring down, he traversed the Warm Bay Road, which features a series of unrelenting hills with little rest. He crossed the finish line in good spirits despite his backs, arms and legs being completely drenched with mud. The top female runner on the day was Lauren Whyte, who battled Jonathan Zangg for the top spot in the 11.5-km division. Whyte eventually placed second with a time of 50:37, 29 seconds behind Zang. Afterwards, the marathon hosted a hot dog barbeque, with the rain still pouring down. "People stayed and they actually went in the warm springs,” said Markley. "We didn't have a tarp up or anything but people still stayed around the fire, it was great. Markley said the increased turnout was rewarding to see but also a little daunting. "We were setting up for the usual crowd,” she said. Markley has participated in the marathon 13 times, while her husband has run it 17 times. "When you organize it, it's hard to run in it as well but it's still fun,” said Markley. Way to go Atlin! Congratulations to each of the 60 participants for your performance. And thank you to all the volunteers and organizers. This is how to keep a community on the map. I have always felt that Atlin is like a Little Sister to Whitehorse, and I love that place.